MIDTERMS: It all comes down to Florida! Another angle is that Florida is the most influential swing state that dictates the outcome of the 2020 U.S. presidential election. 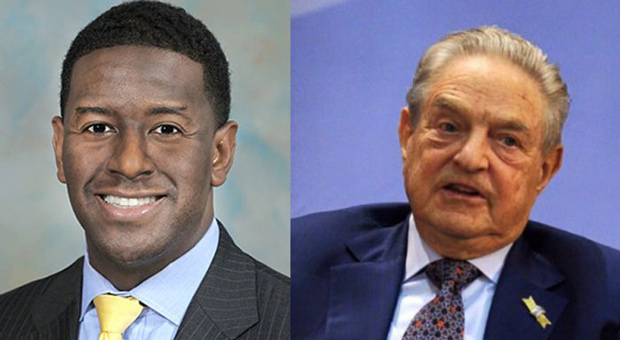 Just like Obama, Trudeau, Peña Nieto, Marcon, Merkel and others pawns, Andrew Gillum is just another Soros-funded puppet. *American electoral history shows that whichever party occupies the Florida Governor’s mansion during the U.S. presidential election usually wins the POTUS! That’s because the state’s executive branch controls the election process and apparatus which is responsible for certifying Florida’s 29 electoral votes. This is how FL Governor Jeb Bush was able to steal the presidential election for his brother in 2000. When that’s not the case, the POTUS candidate who receives Florida’s electoral votes almost always triumphs. Because the stakes are so high this year, Deep State is set on installing Gillum — an ultra-liberal lightweight as governor — who could not even function responsibly as the mayor of a small city. In this way, the Democrat controllers will compel him to do whatever they want when 2020 election theft begins. In fact, the entire MSM, with the exception of FOX News, is giving Gillum tons of free campaign publicity. The CIA’s Mockingbird Media transformed [OVERNIGHT] the hopelessly corrupt, woefully incompetent and willfully negligent Tallahassee mayor into Obama 2.0. Gillum has been meticulously groomed over decades by his Deep State masters just like Obama was by his C.I.A. handlers. The Left juggernaut is rolling across the Sunshine State on a very serious mission to steal this vital election because they know what’s truly at stake. The NWO globalist cabal will not permit a loss, even if the RED tsunami overwhelms their little blue wave. The Democrat political establishment couldn’t care less about being caught in criminal acts or obvious corrupt conduct. The highly organized Kavanaugh character assassination plot demonstrated this quite graphically. This article-in-progress will be furthered added to over the coming days. SOTN felt great urgency to immediately issue this SOS. The Florida Republican Party is so distracted right now they don’t have their eye on the ball. Likewise, the focus of the Republican National Committee is understandably diffused, just as the Left — through chaos-causing initiatives being launched nationwide — is causing the RNC to dissipate their energies. Special Note: The $64,000 question here: Are the Deep State geoengineers sending another hurricane toward Tallahassee for Mayor Gillum’s sake? It’s entirely true that Mayor Gillum screwed up so much during the last major hurricane — Hermine — that it’s not beyond the Democrat Deep State to send another hurricane his way so that he can somehow shine this time around.